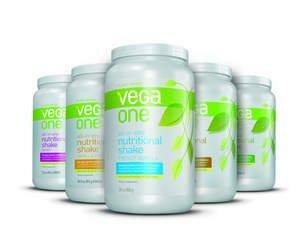 EMERYVILLE, CA–(Marketwired – Jun 25, 2014) – Plant-based nutrition company, Vega, has received 100% post-consumer Recycled Content certification from leading third-party certification firm, SCS Global Services, for its recycled post-consumer (PCR) plastic bottles. Vega’s new packaging, used for its popular nutritional supplements, is made with Envision Plastics’ EcoPrime™ resin, the first food grade recycled HDPE (#2) plastic available in the marketplace. Vega launched its sustainable packaging initiative after an internal sustainability audit revealed that over 70% of its carbon footprint was related to its packaging materials, specifically petroleum-derived virgin HDPE plastic. As part of its “Journey to Zero” initiative to reduce greenhouse gas emissions, Vega partnered with Envision Plastics to develop a system for recycling plastic jugs, milk bottles, and other #2 plastics into a food grade vessel. SCS has been certifying recycled content claims since 1989. The certification audit determined that Vega and Envision’s production data and material tracking procedures are maintained and that recycled material was derived from verifiable suppliers. According to Vega’s research, in 2014 its switch from virgin plastic to 100% certified PCR bottles will result in 278 fewer tons of CO2 emissions (63% less), divert 233 tons of plastic from the waste stream, and use 86% less energy than virgin plastic. But this news article indicates that the use of virgin plastic is not necessary. The use of virgin plastic with recycled plastic is strictly driven by preference. In some applications, use of virgin plastic is a benefit to the performance of the item to be molded or manufactured. In other applications, recycled plastic is completely suitable at 100% content levels. Customers make their decisions based upon part performance requirements, relative cost of virgin vs. recycled plastic and whether they want to make sustainability claims involving the use of recycled plastics. I hope that this was somewhat helpful. Thank you for the prompt response! Much appreciated!